﻿ The ORIGINAL Discover Saipan! 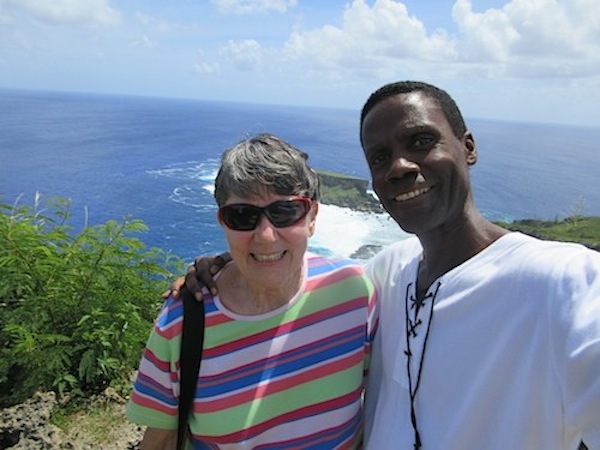 Personalized tours w/the Jamaican on Saipan! 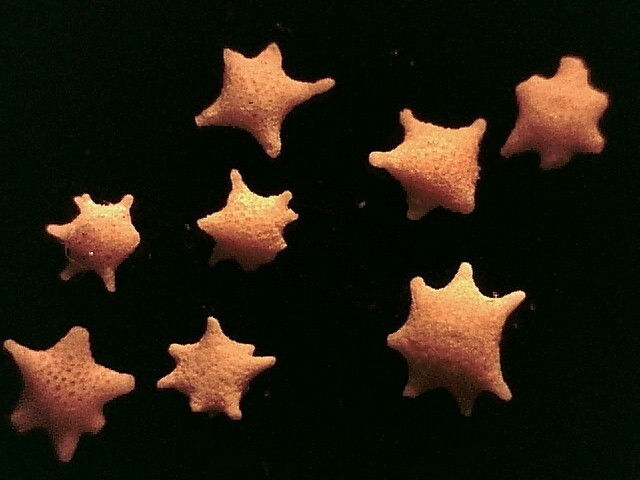 游塞班. 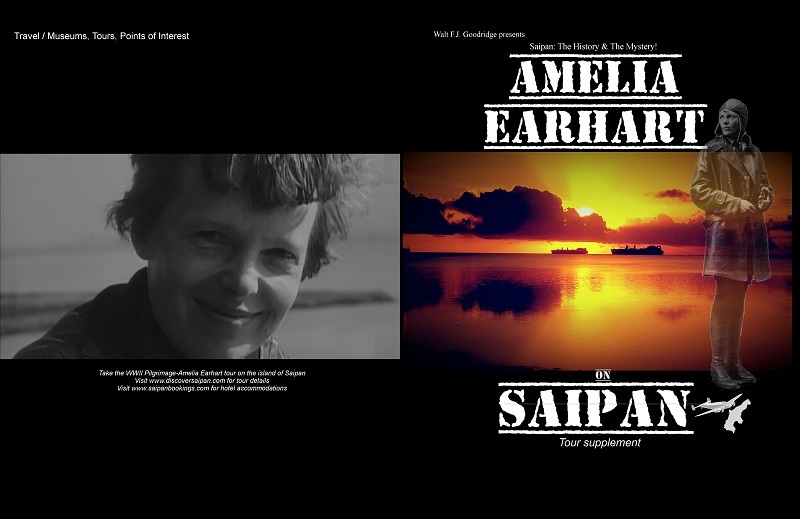 Your saipan tour guide providing Historical, WWII, Amelia Earhart or Scenic Nature day tours and cruise ship shore excursions of Saipan, Tinian and Rota, Commonwealth of the Northern Mariana Islands (CNMI). What is a "personalized" tour? • Intimate--No huge, noisy crowds! • Conversational--Ask absolutely ANYTHING you want! • Customizable--More of what you like, less of what you don't! • Flexible--Want to go back to that first site? No problem! • Unpredictable--may include a special treat! 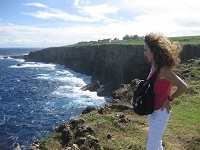 Take my personalized tour and you, too, can discover Saipan, explore Saipan, understand Saipan, and really get to know Saipan (as well as Tinian and Rota) in ways most people never will! 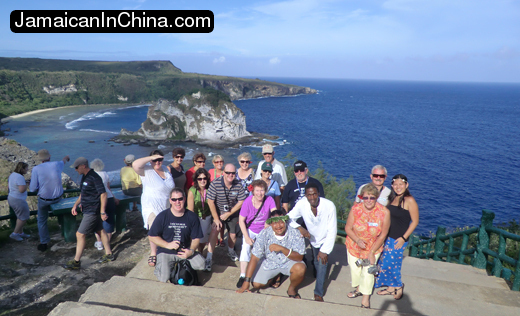 Typically, tours on Saipan are conducted from inside big buses of 50 or more people, visiting just a few manicured sites, lasting for just a few hours, and narrated by a tour guide who has memorized some approved facts and figures-- doing what amounts to a job. Now, that may be okay for some folks. But what if you had a guide for an entire day; someone who does this as his passion; someone who could take you off the beaten path, show you sites and sights the average tourist never gets to see; taking detours based on your unique interests, in a more intimate setting, with one-on-one conversation in which you could ask anything about the island, and get a real person's perspective while you tour the island? What if you could get all that, AND get to see all the standard, manicured sites, too! Well, that's what a personalized tour is! 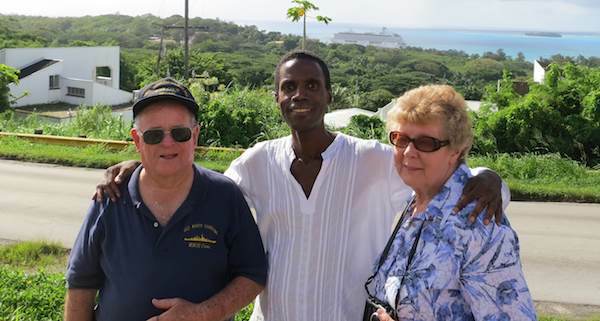 Check out Reginald & Al's personalized tour! "Not all tours are created equal!" Every customer is unique. Some have unusual requests for their visits to Saipan, Tinian, Rota, Pagan and Guam--everything from simply finding unique accommodations and transportation to locating specific individuals for genealogical research, or historical/cultural artifacts for study, to visiting "off limits" areas, and doing unique activities! Whatever your unique request, my mission is to "make it happen" for you. In the process, I do everything I can --leveraging professional as well as personal contacts, calling in favors, harnessing my experience in unrelated industries and backgrounds--to make your request come true. As a result, you may end up enjoying a tour experience that doesn't currently exist, and that likely will not be offered to anyone else in the future in quite the same way! That's my Discover Saipan advantage, and that's what you pay for! Sure, you'll pay a bit more for it, but the overall experience, the information, the connection to your guide, plus the photos and memories you'll take with you will be priceless! Highest point on the island! Yes, Saipan is many things to many people. Depending on whom you ask, and when you ask, Saipan could be a paradise get-away, a secluded beach, a place to meet the person of your dreams, a den of corruption or, as it is for many, simply a place they call "home." And despite whatever changes, occupations, takeovers, scandals, scars or tsunamis sweep over the island, there is always something to do and see differently on Saipan! 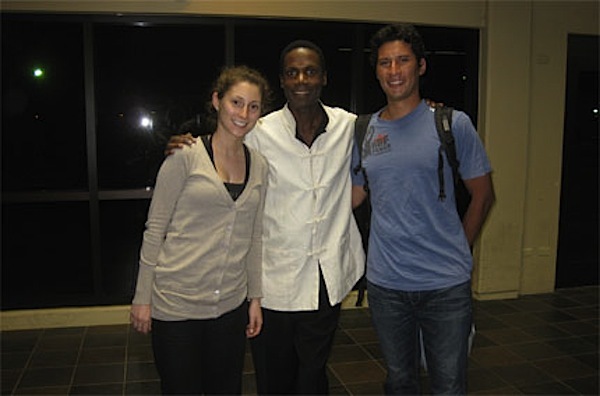 - Being born and raised in Jamaica offered me a different view of reality. - As a Caribbean, I have a positive bias towards island living. - As a writer, I have an eye for detail. - Being a native English-speaker, I fill a need in this part of the world! - My Ivy League education gave me a unique perspective. - My career as an engineer ingrained in me a habit of thoroughness. - As a vegetarian, nomad and minimalist, I challenge paradigms. 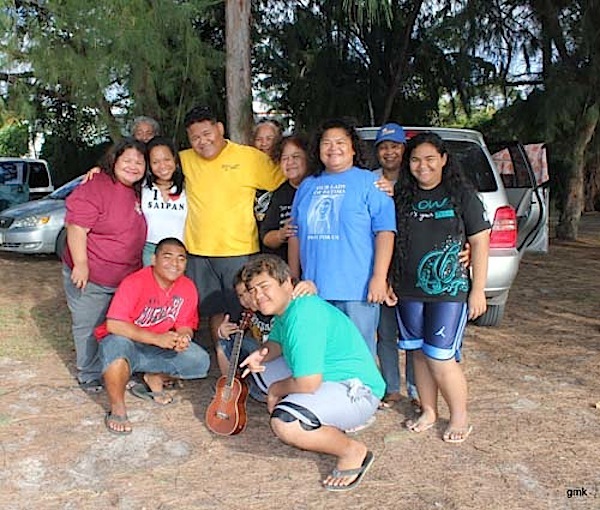 - Spending most of my life in the heart of New York City, offered me an experience that serves as an insightful contrast to the pace of this my second/third life on Saipan. - And, finally, as an entrepreneur coach who helps people discover and pursue their passions, I can see value in just about anything! - In other words: I can help you experience Saipan in ways others can't! You're in for a treat and an experience! Suzanne got exactly what she wanted, and before long, I was giving tours of the island to visitors from all over the world. I've created a unique adventure that few tourists actually get to experience. Here's a little background on Saipan! SAIPAN! You don't really know US! How well do you know the US? Everyone knows Hawaii. That's part of the United States. The Virgin Islands? That's US, too. Alaska? Puerto Rico? Guam? Yes. Yes. Yes. American Samoa? Well the name says it. They're all part of US. However, many people don't know about the Commonwealth of the Northern Mariana Islands (CNMI)--a 15-island archipelago that includes the islands of Tinian, Rota and the capital island of Saipan. It's a lesser-known territory of the United States, located in the western Pacific Ocean about four hours from Japan. And until you've discovered Saipan, you can't really say you know US, now can you? 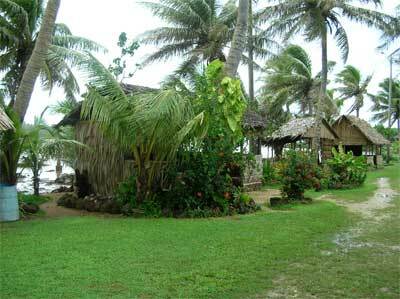 The indigenous Chamorro and Carolinian populations of Micronesia first discovered Saipan, and have been living here for thousands of years before the Spanish and even the Germans discovered it! The Japanese "discovered" Saipan, too! It's been a favorite vacation spot for decades. Thousands visit Saipan's white sand beaches and enjoy Saipan's water sports, world class diving, unique mix of cultures and more! US military personnel and their families know Saipan. Saipan was the battle ground for one of the most fiercely fought battles of World War II, and Tinian was the take-off point for the infamous Enola Gay flight to Hiroshima. Contract workers from Asia and the Pacific, too, "discovered" Saipan. For many years, Saipan's garment industry attracted thousands of workers in search of higher wages and opportunity. 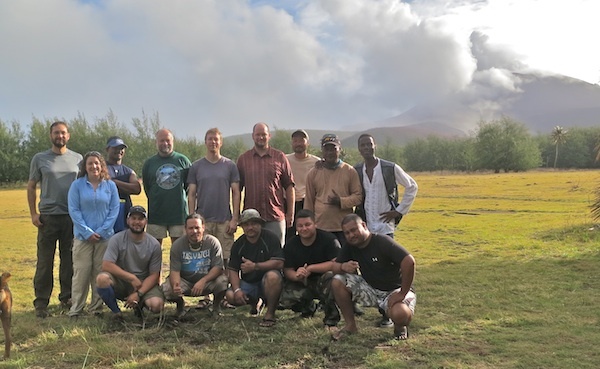 And quite recently, Saipan, situated atop the Marianas Trench--the deepest part of the world's oceans-- was the site of a grass roots conservation effort that resulted in the landmark designation of the Marianas Trench Marine Monument. But, even so, Saipan is still America's best kept secret! Isn't it time YOU discovered Saipan, too? • tailored for YOUR interests and passions! 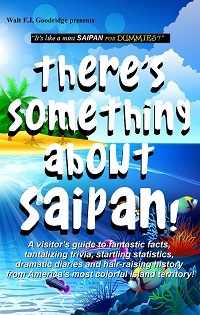 Yes, Saipan is many things! It's a language learning haven. It's a tropical paradise. It's a former war zone. 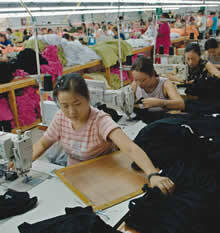 It's a sweatshop case study. But not everyone can show it to you the right way so you really "get" Saipan. Not everyone is able to give you the one-on-one attention, private tour, off-the-beaten path experience with thought-provoking narration and a unique perspective. While "they" cater to large groups of tourists on a tight, rushed schedule, you and I can have some stimulating conversation that challenges your perceptions of yourself, and exposes your cultural blindspots, or just relax at my favorite vegan spot and discuss politics, dating or retiring on Saipan while eating cold papayas overlooking an amazing cliffside view! If this is one of your last see-the-world adventures, there's no better place than Saipan to make the experience memorable and give you something to remember and talk about for years after. 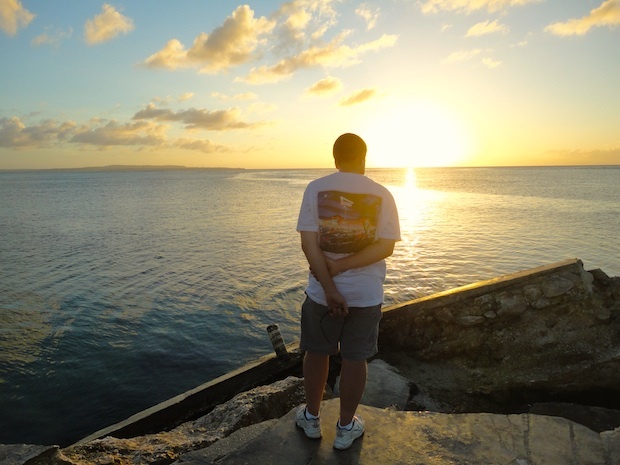 You'll experience more of the world during one day on Saipan than you might on any other leg of your world travel! Looking for an English-speaking Guam guide? | Ground Business Services? 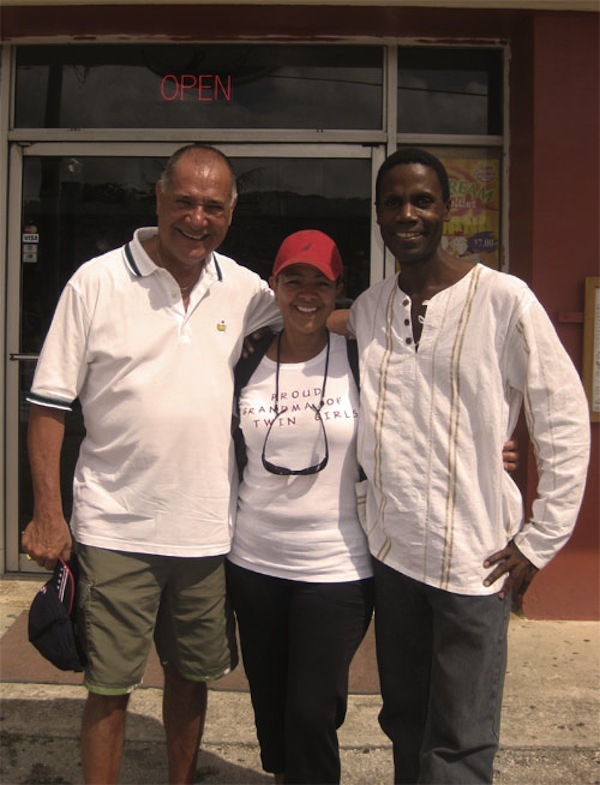 | a Film Location Manager? Looking for a "fixer" on Saipan? 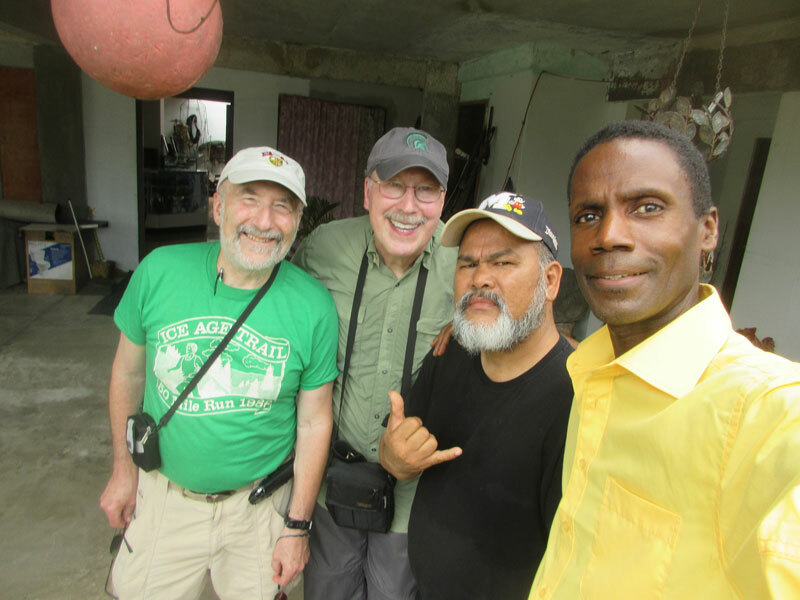 In addition to tours, I also take on other unique projects that require a familiarity with Saipan's culture and geography. I recently provided location management services for ZanyBros, Korea's most famous video production company known for their work with K-pop artists (part of the "Hanryu" Korean Wave) as they worked with popular Chinese idol group, SNH48! I also recently provided "fixer" services for GDW for a recent project here on Saipan! I also gave a tour of Saipan to a production crew from the China Travel Channel. Here's a clip that aired April 12, 2017! If you can't make it! 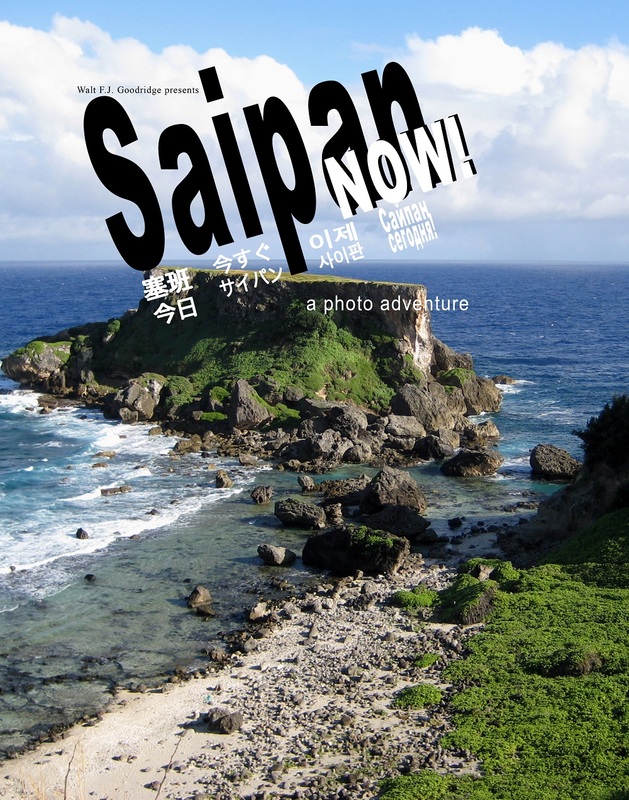 "...the newest, most current, all-photo travel guide & souvenir book about Saipan as it exists in modern times!" Yes, there's something about Saipan that endears it to visitors and residents alike. But what is it exactly? Is it the weather? Is it the unique history? 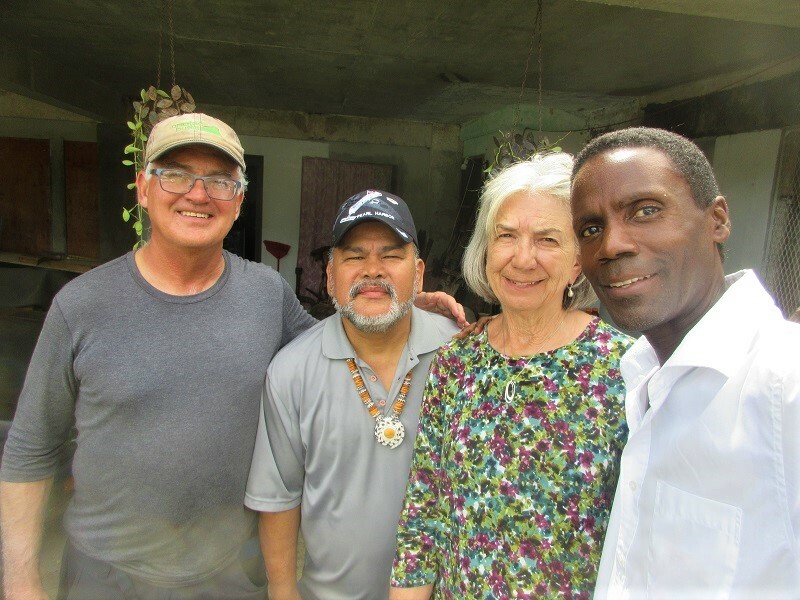 Is it the warm, welcoming indigenous Chamorro and Carolinian people? 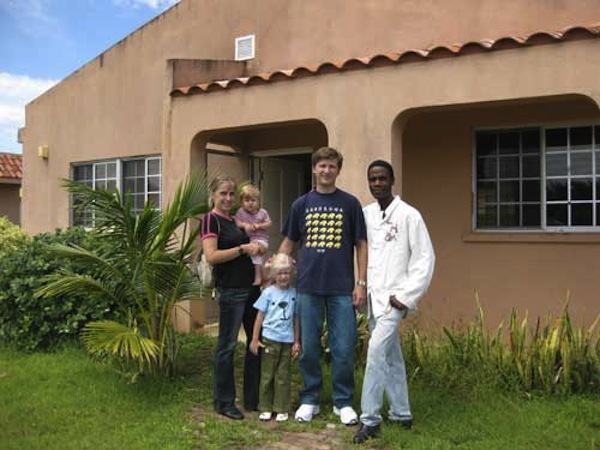 Is it the unique mix of guest workers and expats from all over the world? Is it the unique, possibly magical. energetically enhanced proximity to the Marianas Trench, a combination of all these or something as yet unidentified? Read More! Notebook, blank journal, mug, clock, tote bag, stuido pouch, drawstring bag and more! 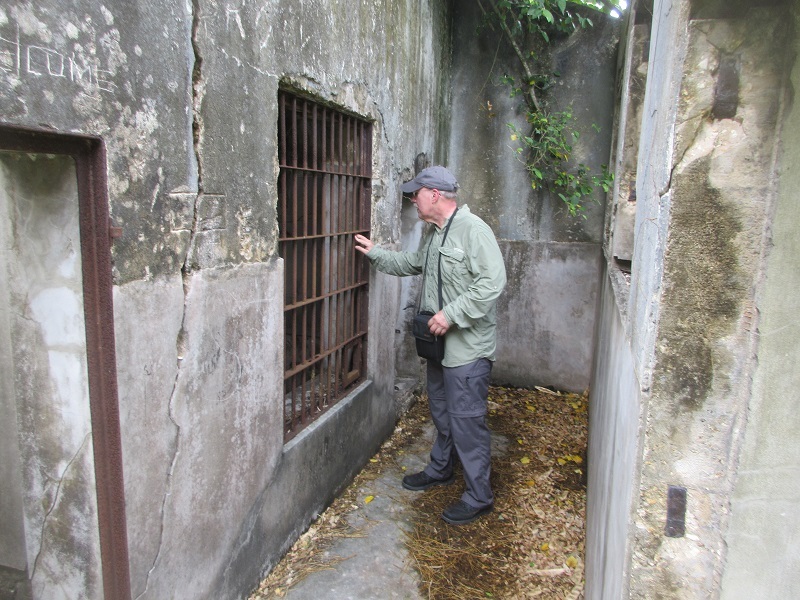 Reginald inspects the Old Japanese Jail where Amelia Earhart was held captive. 90-year old veteran, Lloyd Glick, experienced the personalized WWII Pilgrimage of a lifetime on Saipan! 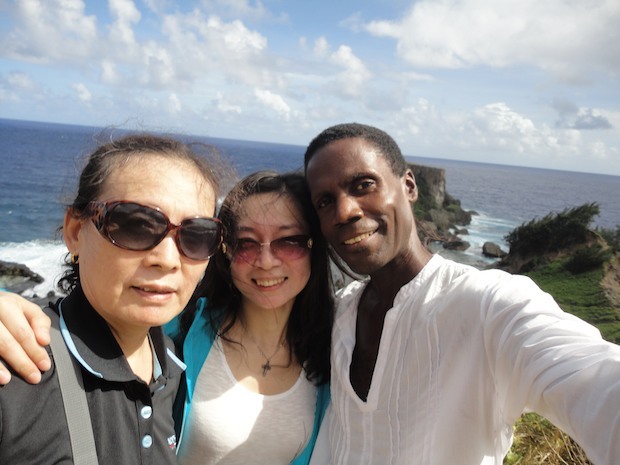 Denise's first-ever trip outside of China was to Saipan!! Denise from Nanjing with her mom! thank you for the impressive effort you put forth on my behalf yesterday on the tour. 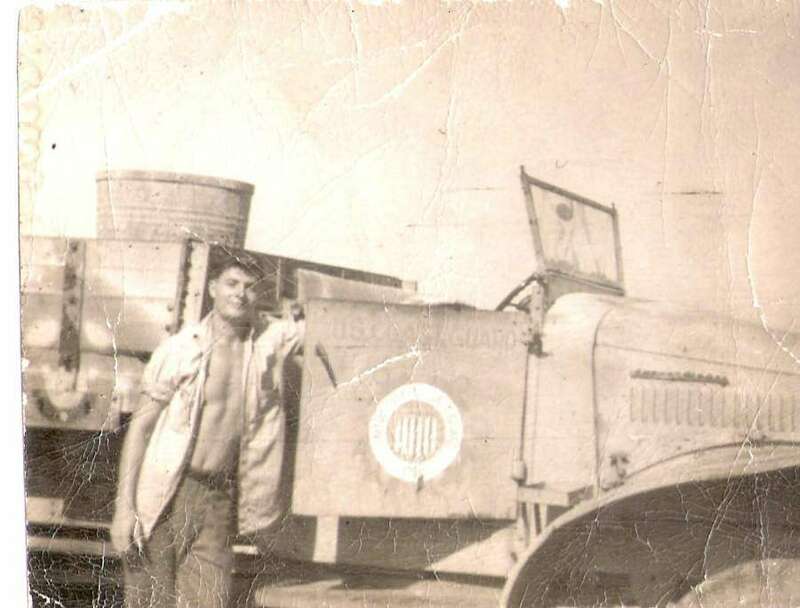 You certainly planned the tour around my obvious desires and fulfilled all of the curiosity and then some that I had when I arrived​ on the island of Saipan as a son of a critically wounded Marine from the 2nd Marine Division. 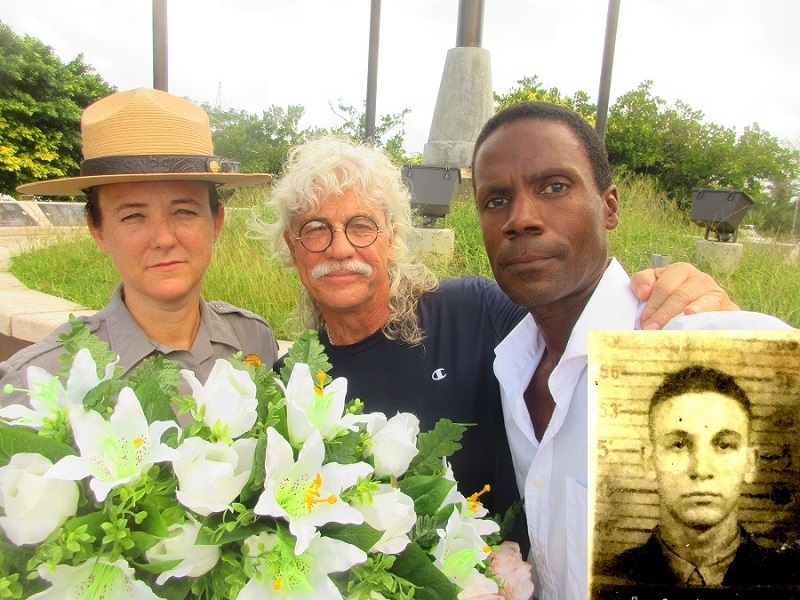 I leave the island enriched with historical data that can live on for generations in my family. Thanks Again!" 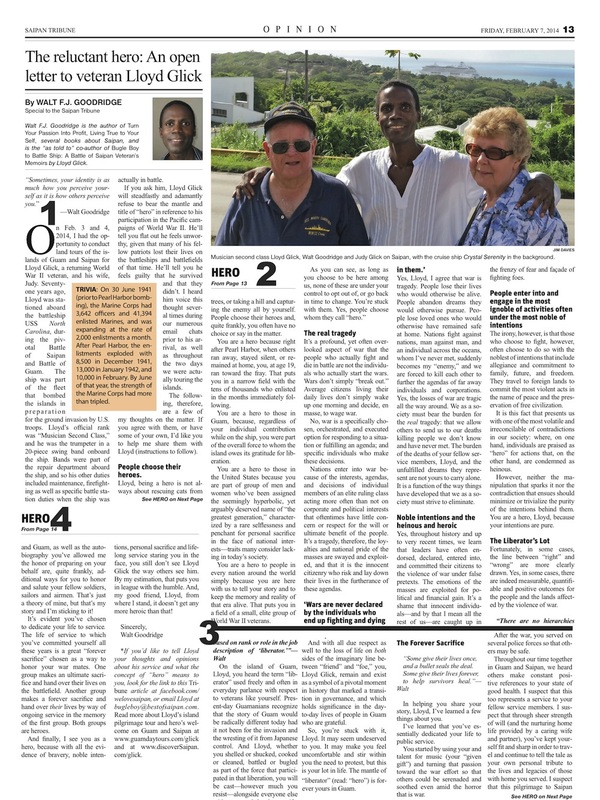 -- Patrick Hayes (READ MORE and see the article that appeared in Saipan's local newspapers! 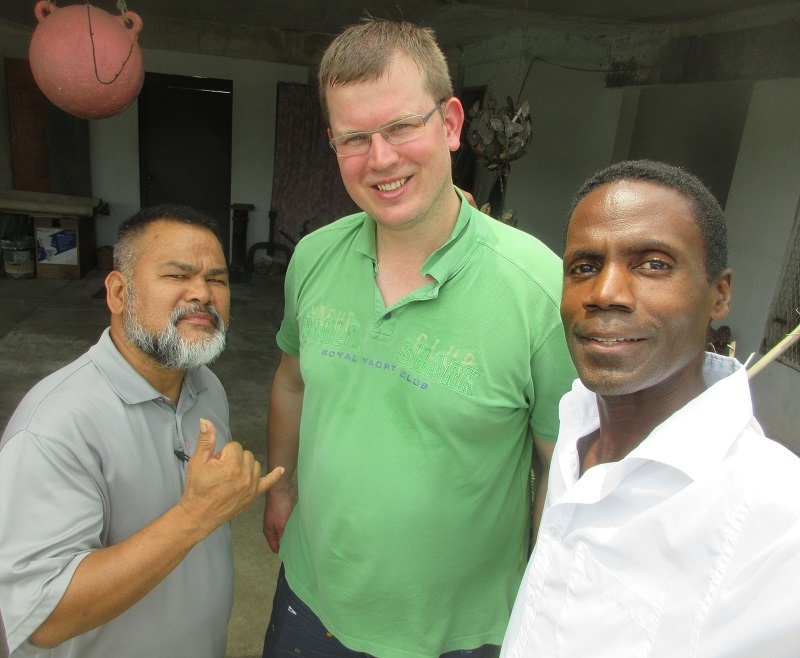 Hasse from the Netherlands visited Saipan, Tinian and Rota! 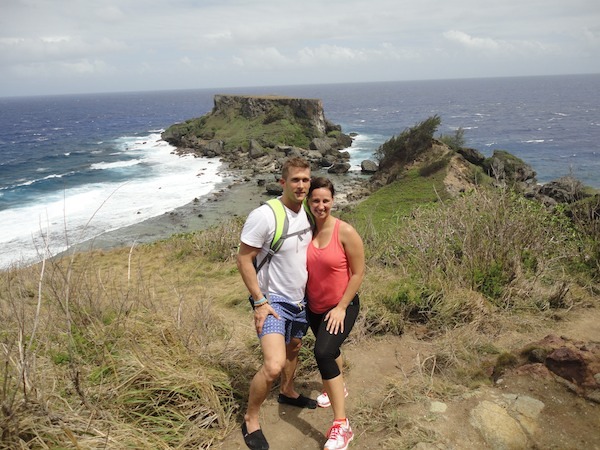 "I had an unbelievable time on Saipan!!! Thank you so much for all of your help with organizing such an awesome experience! I will definitely write more later, but I just couldn't let one more second go by without letting you know how much I appreciate what you've done!!!" --Kay H. Read what Kay wrote later! "We have been on many tours in many countries and this tour is among the best. 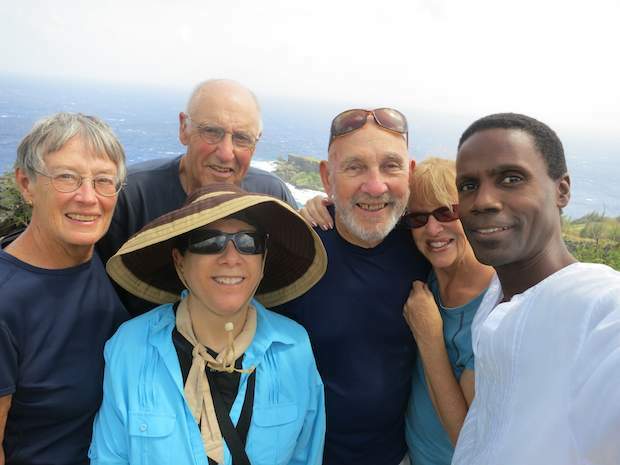 Walt is a transplant from Jamaica via NYC but has fallen in love with Saipan. He is incredibly knowledgeable and enthusiastically shares that knowledge. He is incredibly attentive to every detail. The tour was exhaustive and insightful. We felt we really knew Saipan at its conclusion. If I had a complaint, it would be the high cost. 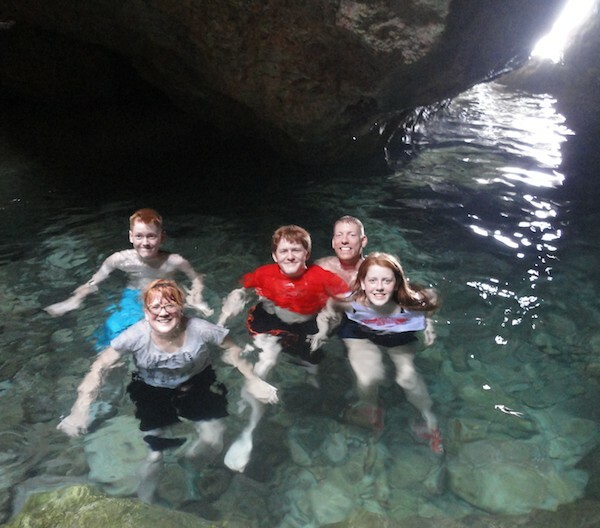 Although initially reluctant because of the price, we are glad we chose to do the tour." R.F. from Hong Kong enjoyed the activities! p.s. 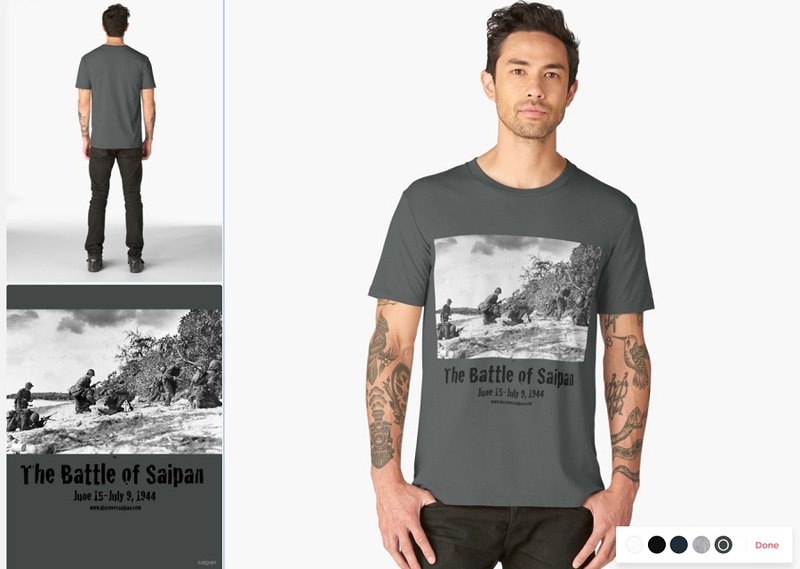 WeLoveSaipan.com is really cool! BEFORE: "Hi Walt, We are coming to Saipan just for 3 days to run away from the busy/crazy life of Seoul. 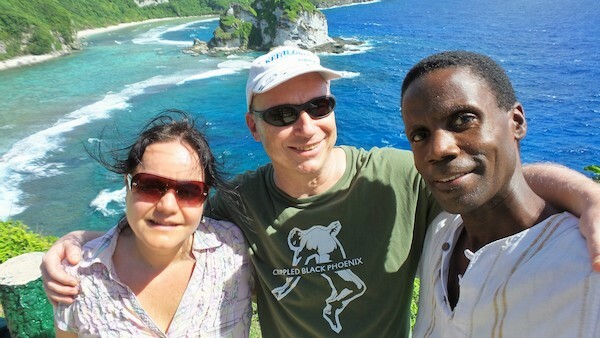 The world is big, but we decided to come to Saipan without any clues about the island, or the things to do and visit. Your website about discovering Saipan just gave me the will to visit the island!" 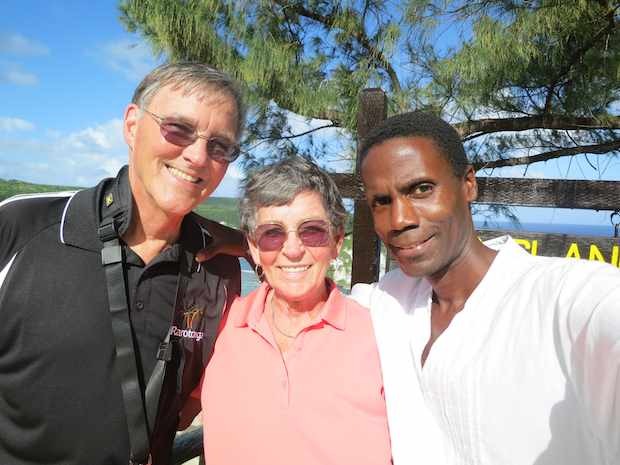 "Kind words from Ukraine, via New York"
World travelers to over 129 countries discover Saipan!" "41 Australians and the Jamaican on Saipan!!" Read the adventure of the last big tour I did for a cruise ship group "The Short Happy Tale of 41 Australians and...."
BEFORE: "Hi Walt, I'm a history professor at Hawaii Pacific University in Honolulu, and I'm doing a research project on government systems in the Pacific. So, I'm interested in historical sites and buildings related especially to government history (and WWII history)...."
AFTER: "Walt provided an excellent tour of Saipan. It was both interesting and informative. 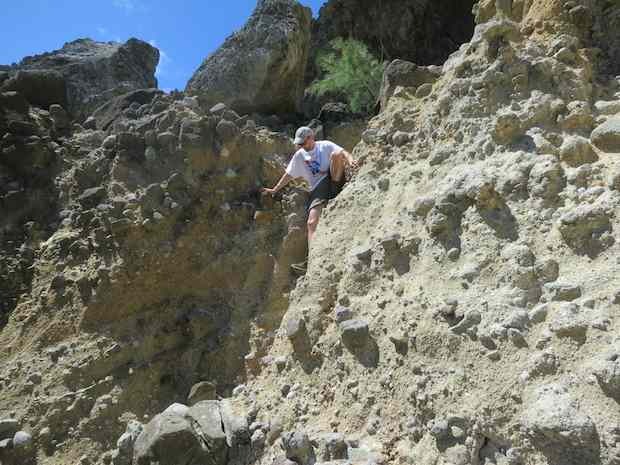 I wanted to see a number of sites off the beaten path, and Walt did the research to insure that we found those places easily. What I especially liked was that Walt personalized my tour based on my interests. 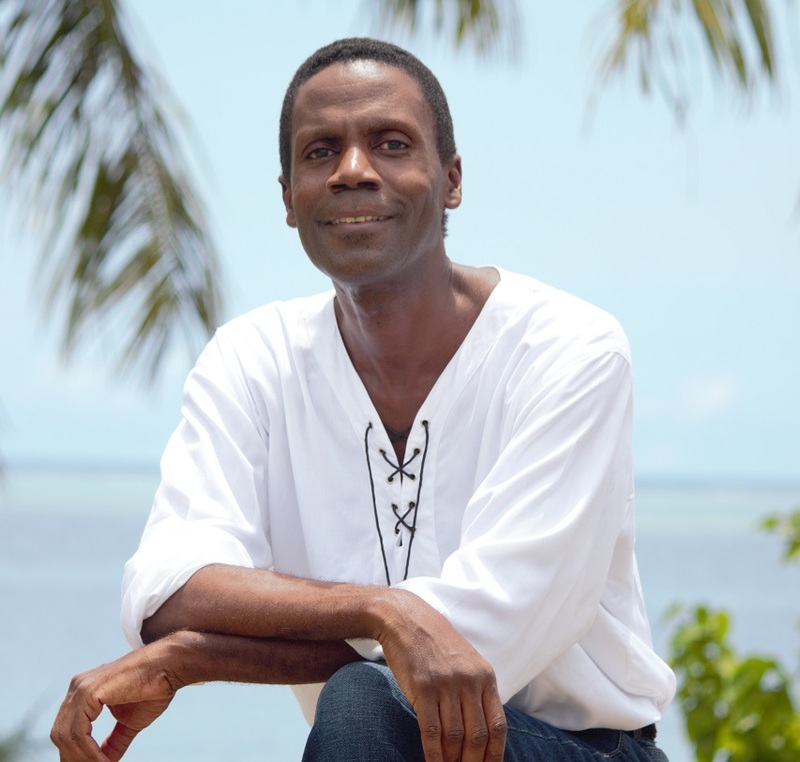 He's also a wealth of knowledge about the island and has a genuine passion for what he does. If you really want to see what Saipan has to offer, go with Walt!" 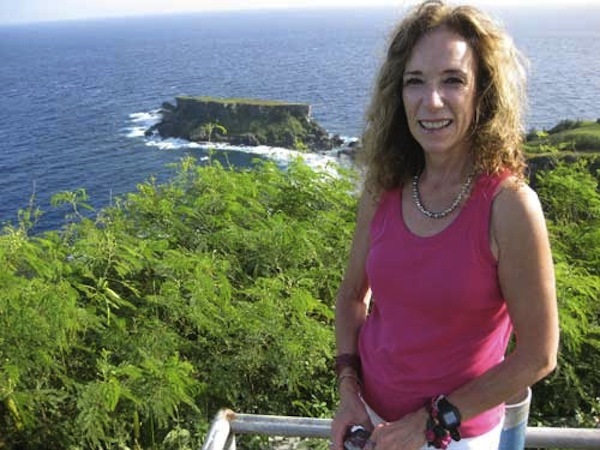 "I discovered Saipan through my interest in off-the-beaten path travel, world geography, World War II history, Manhattan Project history, and island life. While Guam is moderately well known, the remaining Marianas islands are often overlooked. Saipan is a tropical Pacific island where US ditizens can enter with little to no hassle or visa limitations. Specifically, I discovered Saipan in 2012 while researching potential side trips from a work trip to Guam. I have already visited Palau, Pohnpei, Chuuk, Majuro, and lived on Johnston Atoll so the Northern Marianas were a natural extension. Walt's user friendly website will assist other travellers who might be less familiar with Oceania. "Wolfgang and Gloria in the woods!" 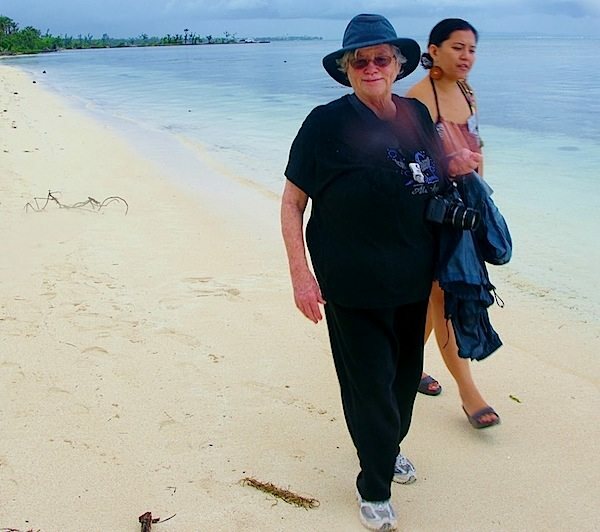 "Kay and Barbara at Bird Island !" 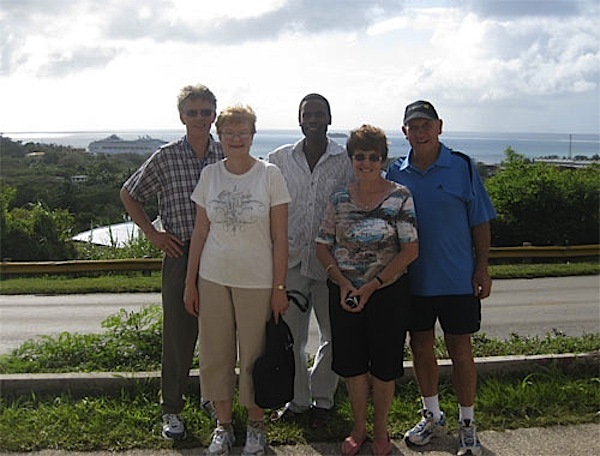 "Globetrekkers, Patricia, Neil, Del, Linda and Marcia (front) on Saipan!" 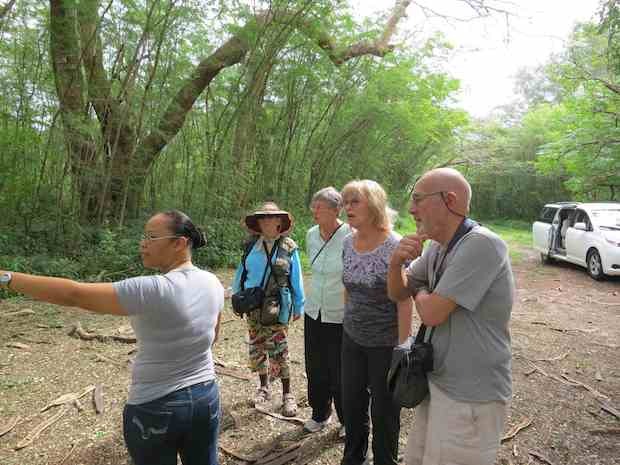 "Tinian native tour guide, Laila, describes daily life (and where to find the island's world famous hot peppers) to Marcia, Patricia, Linda and Del! 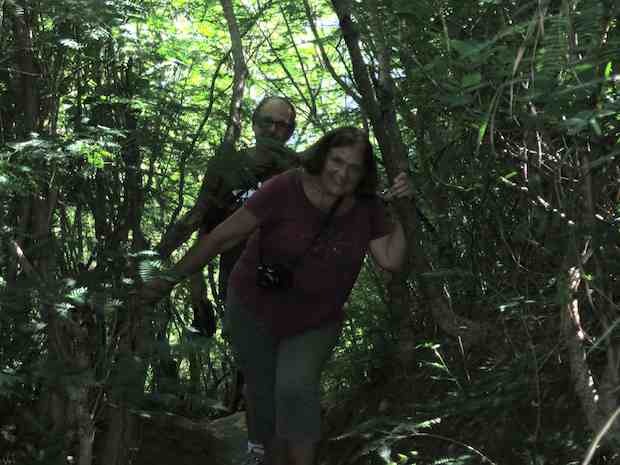 who took a Tinian day trip from Saipan"
"I was surprised at the amount of history, both World War II and island history that Walt was able to orally pass on as well as show me. Saipan and Tinian are different from Guam, Walt was able to explain the different backgrounds and how they play out in today's society. Reading about the history and then daily life of a location like Saipan doesn't have the same impact as being there, touching history and putting ones self in the place where that history happened. That's why I went, and that's what Walt was able to deliver for me. Thanks for a fascinating and fun two days!"--D.D. 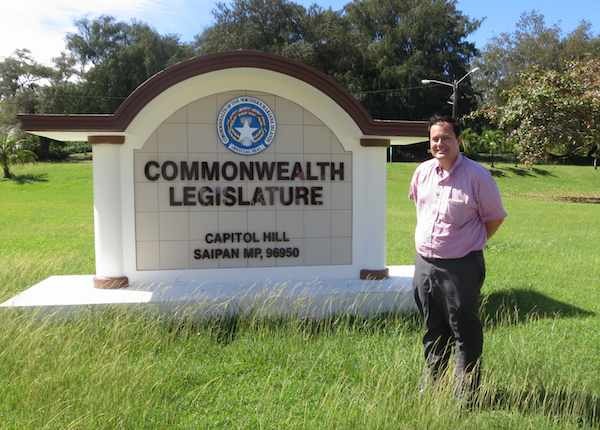 "I came to Saipan and Tinian to explore the history of the Mariana Islands and focus on visiting historic sites from World War II. I desired a tour guide, not because I was afraid to travel alone but because of the desire to see off the beaten path locations, gain local knowledge and not have to do even more research into times, directions and the location safety. I'd never met or spoken with Walt before and, going only by his website, took my chances." "Walt delivered and exceeded on all expectations for my two day tour. Things started right with Walt awaiting me at the Saipan airport, getting us over to Tinian and seeing all of the sites I desired to see along with many other hidden locations that where unknown to me including the SEABEEs monument and both of Tinian's Shinto Shrines. We returned to Saipan early the first day in order to make the documentary at the American Memorial Park before they closed at 5pm (local knowledge kicking in). Walt dropped me off at my hotel, and I was off to dinner on my own." 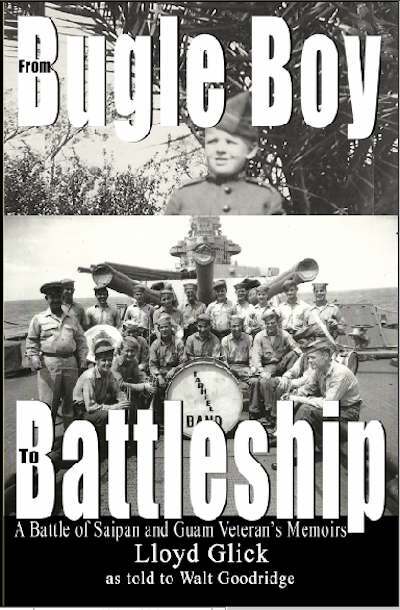 "Punctually the next morning, Walt was waiting for me in a car to start my exploration of Saipan. We took a quick 15 minute detour to the harbor to assist two customers from another group who were having a small issue, and Walt was there to help out. We proceeded south visiting World War II sites and other Saipan related historical/scenic locations I didn't know about ahead of time including the garment factory district, Ladder Beach and the Old Japanese Jail. We drove, hiked at various spots and sometimes stopped for the photo opportunity. Walt was never pushy and listened to what I wanted to do, and if I wanted more or less time at a location, he was happy to oblige. We finished the tour after seeing everything on my World War II list along with much much more. We arrived at the airport with plenty of time to catch my flight and reflect on the wonderful two day trip." Jermaine and Nikki from Shanghai by way of Vancouver! • Read what USA Today said about my tours!